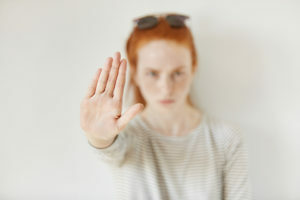 How To Handle People Who Can’t Take a “NO” Gracefully? How do you know when its appropriate your desire? With Reid Mihalko from http://www.ReidAboutSex.com and Cathy Vartuli from http://www.TheIntimacyDojo.com. Cathy: This is Reid Mihalko from ReidAboutSex.com and it does feel awkward and I definitely felt I’ve been in that position when I felt like it mattered so much for the other person to say yes but it does not necessarily make the person comfortable or safe. As adults, we’re responsible for getting our own needs met then ask another people to participate if they want to. As a small child, we do have needs we can’t get them in our way. Reid: Yeah. And they’re like Oh my god if you say no to me, what does it mean about myself? So a lot of people again have taken workshops and done the work to realize that we all do this. Like I get that I make things mean things and I can handle my disappointment around what I’m making it mean and I often tell people like oh just so you know I can handle my own disappointment but I’m a star fucker and you’re a star. My ego wants this and I can handle that. I can sit inside of the container that is me and own it. Keep it from gushing out on to you. That’s a pretty high level of social and self-awareness applied where you can own it and also kind of wrangle it a little bit or at least turn the faucet or the hose down so there are only dribbles not a spray going all over the place for people. There’s those two things, another thing that can be interesting that I’ve noticed around like creepiness cause the starvation pulling a curse to some people because that’s creepy. I don’t know what’s going on. Then there’s the having a hidden agenda that I am not telling you that it is creepy cause it’s underneath. It’s different than starvation or the needy. Cathy: I think it goes to all of those because if I’m not telling you that’s my agenda, if I’m kind of pulling at you cause I want stuffs. I want either my identity, the status or scarcity, I’m hungry or starvation or any of those. If I’m trying to get those met without owning them for myself and owning it to the other person that can come across as creepy. So, I’m trying to get something without owning it. Reid: The awareness of this can help unconscious agendas like I’m starving, I’m trying to cut the line. I make this mean something about myself, myself worth. Then there’s the like rejection means something from my past kind of a thing. Cathy: I’m not sexual or desirable or whatever. Reid: This is proof than I don’t want you to reject me because I don’t want proof about the thing I think about myself as. So maybe that’s a third quality. When I say agenda, I mean I know what I’m up to and I’m being sneaky, right? Or I’m afraid to reveal my agenda so I have to cloak it because I’m not supposed to own my sexuality or supposed to do this or supposed to do that. That can be like there’s a cleaner version of agenda where you have shame. Then there’s the like I’m evil trying to trick you kind of a thing. Cathy: I think there’s also kind of related to status. There’s time that people project into someone else. That happened to stars a lot. It’s not like hey, you’re willing to get out. You’ve got a lot of courage, you worked hard on yourself and you’re out there in front of a lot of people making a difference which is very attractive. There’s also the, I’m going to project my needs and expectations on you. Then if I can get you sleep with me, I feel somewhat won and gotten what I thought I need with all this time. It’s not about being present to the real person. I think a lot of people. Reid: I’m worthy if you sleep with me? Cathy: Well, like it is easy for someone who is out of the limelight for someone to decide without knowing you to project on to you the characteristics of someone they need to be close to- an ex-lover, someone who rejected them when they were younger. Projects all those characteristics on to you and then if they get to have the connection, they arrived, they defeated that bad experience in the past because it isn’t real. They are not really present. I know that it can make feel someone not seen the real me. I can kind of feel the energy like you’re trying to fulfill isn’t someone about me but you’ve decided that is on me and you want to get that back from me. I’m not sure about the word of that, it’s a projection kind of thing. They try to get something back and that feels creepy to me. Reid: Creepy or just.. Yeah, I guess there are things to me like a lot of these are not so.. Again this is an experience from a white 6 ft. tall guy. It doesn’t feel creepy to me in the way. You’re a creep. It’s more like oh these are things human beings do, look at this human being doing a human being thing. Cathy: I wasn’t defining the person as creepy, I said the feeling I get that is creepy. Cathy: Yeah like there’s something off and I don’t want really to be around it. Reid: What do you think? These are series of videos that have gone long, we apologize. What do you think about these things? These dynamics? Leave your comments. Ask questions. Thanks. Previous post: When Is The Right Time To Talk To Somebody Being Sexual? Next post: Should I Combine Or Separate Businesses If I Have Multiple Practices?